His story comes right out of a Hollywood movie. It would undoubtedly captivate any audience as it did nearly 200 CPS Energy employees who heard Heriberto “Berto” Guerra’s story of his impressive rise from a young entrepreneurial shoe shine boy to restaurant franchisee owner before he turned 21, and now Chair and CEO of Avanzar Interior Technologies and co-owner of two auto dealerships. What got him there? Three key words from which Guerra lives his life by. Whether he was assembling the “juiciest” hamburgers in Corpus Christi or running a four-time JD Power award-winning seat manufacturing company – quality, service and price. “One day a man walked into my dad’s barbershop with tennis shoes on. My father gave me a look because I hadn’t offered the man a shoe shine. So, I did, and the man said ‘I’m glad you asked because I have these muddy boots in my truck that I keep forgetting to clean up.’ That taught me to always offer service and never judge a book by its cover,” said Guerra. A successful businessman, who also serves as board chair for SAWS, Guerra shared his key ingredients to success at this year’s EmpowerU series earlier this month where the focus centered on customer obsession. 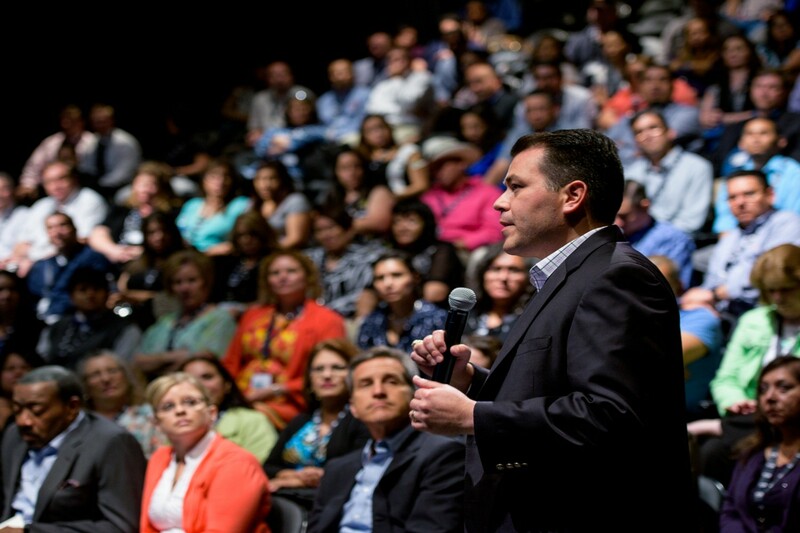 CEO Doyle Beneby kicked off the annual talent development session by recognizing the hard work of employees—encouraging them to go even further by creating an atmosphere of customer obsession. Citing an obvious, but sometimes forgotten fact even for those of us in the utility industry, Beneby emphasized that customers are the reason we are here. CPS Energy Senior VP Frank Almaraz poses a question to a panelist at Empower U. As he did earlier this month for energy leaders from across the world at the Energy Thought Summit, Beneby spoke of the reasons why our industry needs to change, highlighting evolving customer expectations, acceleration of technology adoption and “prosumers” versus consumers. Prosumers being more active than just consuming products and services by advocating for what they buy or being active in product development. CFO Paula Gold Williams followed up by outlining what a unique company we are in the fact that we’re in the top two percent of utilities when it comes to our AA+ credit rating, yet, we’re not far away from our “shareholders.” We see them every day when we walk out the front door, whether that’s at our home or here at work. On any given day, we can talk to someone who is a CPS Energy customer. Meter reader Michael Gomez can appreciate that. He recounted a situation where a customer called with a complaint and how he took personal responsibility for making the situation right on his own time by going to the customer’s home and correcting the problem. It’s that kind of response that would earn Gomez a Rackspace fanatic-emblazoned straight jacket – a coveted award for fanatical support (great customer service) at the nation’s leading managed cloud company. Vice President of Fanatical Support Javad Kabiri says employees must feel empowered to seeing and owning an issue all the way through. He talked about how the locally-based company stayed ahead of the curve by pursuing the managed cloud space even when the then-current business model was working. Beneby’s leadership over the past four years mirrors that leading-edge thinking. The New Energy Economy model initiated in 2011 has made us not only a leader in solar energy, and thus ahead of the environmental regulations curve, but has created a solar manufacturing hub with more than 600 jobs and $800 million in economic impact so far. Innovation is leading our approach for utility and residential solar. In the works are both a “rent-the-roof” (as one media entity dubbed it) and a community solar program that would remove the barriers for customers who can’t afford solar panels or don’t own the roof, have a quality roof or don’t get enough sunlight to make solar possible. Raiford Smith, our Vice President of Corporate Development, is overseeing that program. He told the EmpowerU crowd that one of the key elements of a progressive culture is embracing change. 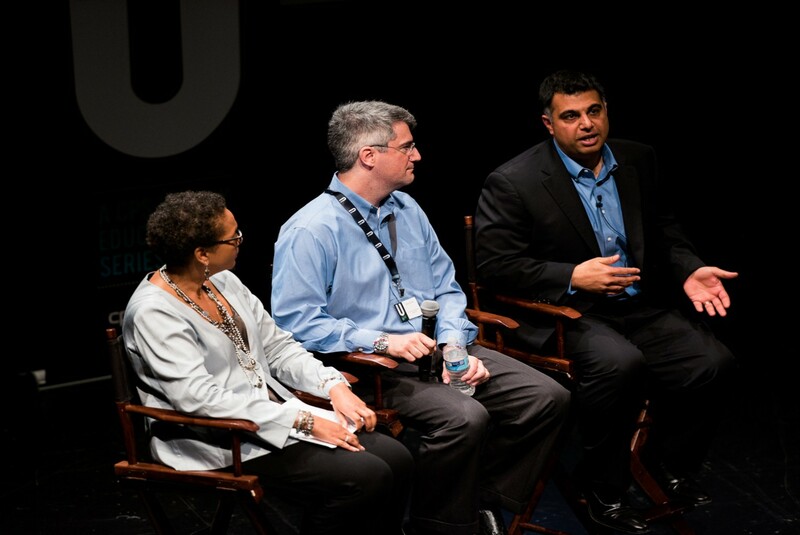 VPs Phyllis Batson and Raiford Smith listen to Rackspace’s Javad Kabiri respond to a question at EmpowerU. “We need to know our customers, know the products and services they want, and enhance our ability to deliver those products and services,” said Smith. The two upcoming pilot solar programs are aimed at doing just that, and have received national attention even in the development stage. USAA’s Neff Hudson brought home the point that mobile is bigger than we think. “It’s not a phone. It’s a personal assistant,” said Neff, vice president of emerging channels. With the customer’s permission, we can serve them better than ever before. We know that to be true because roughly 20 percent of customers checking out our new My Energy Portal are doing so through smartphones. And, we’ll deliver even more content, products and services through our mobile-responsive website launching in the coming weeks. Technology will pave the way for us to “go out and conquer the world for our customers” as Guerra directed the CPS Energy team to do. But the best modern advances can’t replace the three keys he spoke about so passionately in his keynote address. Quality. Service. Price. Customer Service Rep Carolyn Dougherty, who joined CPS Energy just two years ago, voiced heartfelt appreciation for Guerra and sharing his story.